My latest book, which I co-authored with Ed Tittel, is out now and available everywhere computer books are sold! 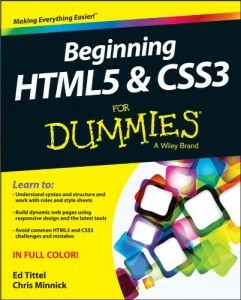 If you have no previous experience with web development and you’re interested in learning to create websites, or if you’re already a web developer and want to brush up on the latest HTML and CSS technologies, this is the book for you! Plus, there are full-color pictures of our cats, Sparky and Mr. Jones, for those of you who might be more interested in pictures of the cats than in learning to make web pages. This book really does have something for everyone!